I don't know whether to laugh or cry. Just when you thought it was safe to think that the Castelperronian (Chatelperronian) was a(nother) dead issue, along come Jean-Jacques Hublin, Sahra Talamo, Michèle Julien, Francine David, Nelly Connet, Pierre Bodu, Bernard Vandermeersch, and Michael P. Richards attempting to resurrect it. I would have thought Easter a better time for that. Perhaps we can extend the metaphor. If the metaphor works, given that it's Hallowe'en, maybe we'll be lucky and the whole matter will settle back into the ground whence it came the minute November 1 comes around. Nah. I'm not so lucky. The Castelperronian, you'll remember, is an inferred technocomplex that has long been thought to have been the product of late Neanderthals who came in contact with modern humans and were trying to emulate the modern tools and ornaments in a haphazard way [haphazard is, by the way, my preferred way to construct the whole matter]. Here's a picture of what the 'industry' is supposed to comprise. It's said to combine the Mousterian [the métier of the Neanderthals] with the Aurignacian [unequivocally associated with not Neanderthals]. Problem is, various authors have investigated the issue from a number of different angles, and the growing consensus is that the "Chatelperronian" is simply the result of stratigraphic mixing at the sites where it's found, and not a coherent assemblage produced by the bipedal ape that was on its way out. 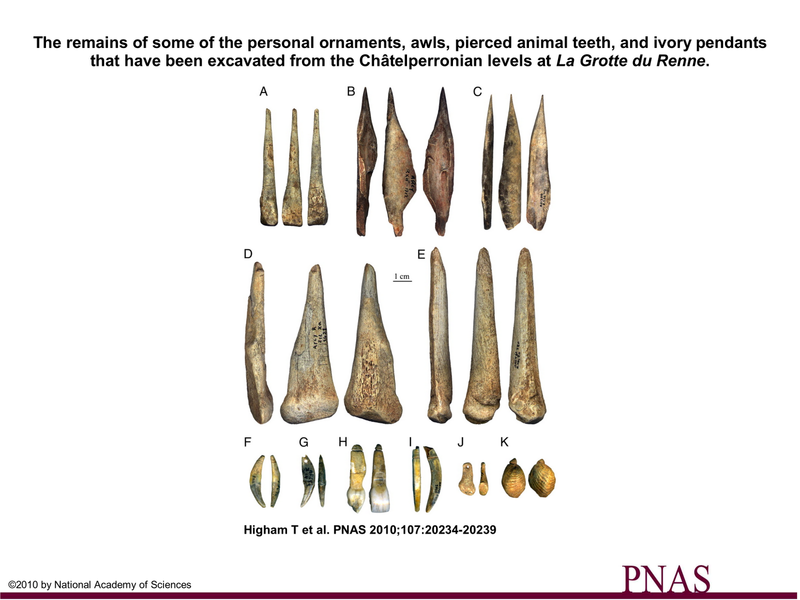 That the Chatelperronian has been found to "occur" at only a very few of the very, very many Neanderthal localities across western Europe, one is naturally suspicious. I have plenty more to say, and I'll get back to it tomorrow, if I'm feeling up to it. But I did want to let you all know that I won't be ducking this one.